This superb and very sweet , ”Ferret – Cream” by Hansa, will help your little one learn all about ferret – creams, for example, that ferrets are crepuscular, which means they spend 14-18 hours a day asleep and are most active around the hours of dawn and dusk! – as well as provide a lifetime of soft cuddles with this adorable stuffed animal. Originally created for exclusive European collectors, each plush animal is meticulously handcrafted from portraits of real animals in their natural habitat. Hansa’s goal is to help educate children and adults alike, about the natural lives of these magnificent creatures, and to understand, respect and appreciate the importance of our co-existence with all animals. Each animal comes with a “Toys that Teach” tag describing in detail the animal’s habitat, lifestyle, gestation period, care of their young and eating habits. Significant research goes into reproducing every animal species. The fabric for the spotted and striped animals is custom designed and exclusively manufactured in small quantities to Hansa’s exacting specifications. Their “coats” are meticulously hand-cut and trimmed, never stamped out by machine. Hand sewn leather paws, swishing tails and especially soulful eyes and faces are lovingly detailed to give each piece their lifelike look. Each and every animal produced is hand finished by Hansa’s artists to create each with their very own unique personality (just as in real life). Help your little one develop vital motor skills and have fun at the same time with this joyful toy! Measures 6.3 x 9.84 x 15.75 inches.Exciting and educational, this would make a memorable gift for any child! 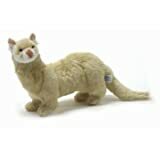 This entry was posted in Ferret Plushes, Ferret Tubes and Toys, Uncategorized and tagged 4555, 77062, Hansa, Standing Cream Ferret 15.75" by Hansa on December 4, 2014 by admin.